Magnesium gluconate is an organometallic pharmaceutical/nutraceutical used for the prevention and treatment of various diseases caused by the low level of magnesium. 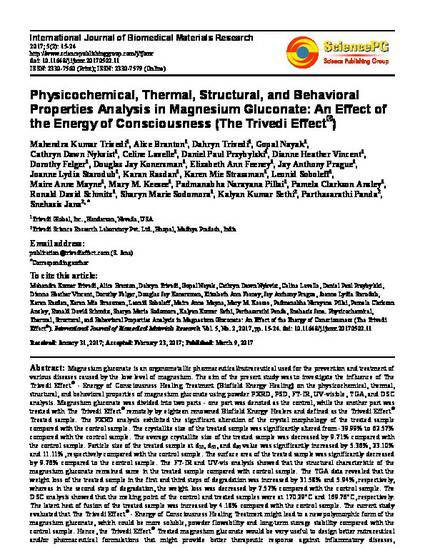 The aim of the present study was to investigate the influence of The Trivedi Effect® - Energy of Consciousness Healing Treatment (Biofield Energy Healing) on the physicochemical, thermal, structural, and behavioral properties of magnesium gluconate using powder PXRD, PSD, FT-IR, UV-visible, TGA, and DSC analysis. Magnesium gluconate was divided into two parts - one part was denoted as the control, while the another part was treated with The Trivedi Effect® remotely by eighteen renowned Biofield Energy Healers and defined as the Trivedi Effect® Treated sample. The PXRD analysis exhibited the significant alteration of the crystal morphology of the treated sample compared with the control sample. The crystallite size of the treated sample was significantly altered from -39.99% to 62.57% compared with the control sample. The average crystallite size of the treated sample was decreased by 9.71% compared with the control sample. Particle size of the treated sample at d10, d50, and d90 value was significantly increased by 5.36%, 23.10% and 11.11%, respectively compared with the control sample. The surface area of the treated sample was significantly decreased by 9.76% compared to the control sample. The FT-IR and UV-vis analysis showed that the structural characteristic of the magnesium gluconate remained same in the treated sample compared with control sample. The TGA data revealed that the weight loss of the treated sample in the first and third steps of degradation was increased by 31.58% and 5.94%, respectively, whereas in the second step of degradation, the weight loss was decreased by 7.57% compared with the control sample. The DSC analysis showed that the melting point of the control and treated samples were at 170.29°C and 169.76°C, respectively. The latent heat of fusion of the treated sample was increased by 4.18% compared with the control sample. The current study evaluated that The Trivedi Effect® - Energy of Consciousness Healing Treatment might lead to a new polymorphic form of the magnesium gluconate, which could be more soluble, powder flowability and long-term storage stability compared with the control sample. Hence, the Trivedi Effect® Treated magnesium gluconate would be very useful to design better nutraceutical and/or pharmaceutical formulations that might provide better therapeutic response against inflammatory diseases, immunological disorders, and other chronic infections.